The story of a lonely spirit and the friends he meets. 60 pages, A5 size. Perfect-bound. This book contains the story of Willow's Tale, as well as eight pages of extras. 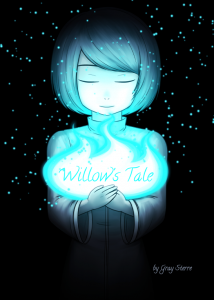 The Tale of Willow and Wren is about a girl that grows up and the precious thing she leaves behind. The Tale of Willow and vine is about a stranger with a restless soul. The Guardian's Lament is the story of the one who has watched everything from the beginning.